Andrea Iannone powered to a splendid third-place podium finish in the Valencia Grand Prix, which brought the 2016 MotoGP World Championship season to a close today at the Cheste circuit. With this result, the rider from Vasto bade farewell in the best possible way to the Ducati Team, with whom in the last two years he scored a fantastic win in the Austrian GP and six podiums (one second place and five thirds). After a good start from the third row, Iannone crossed the line at the end of the opening lap in second place and was then involved in a terrific scrap with Rossi and Marquez. When the Spanish world champion moved into second, Iannone continued his battle with Rossi, getting the better of his fellow Italian on lap 25 and he was able to hold onto third place until the chequered flag. Team-mate Andrea Dovizioso had a good race after qualifying on the second row. The Italian was unable to get a good start however and he finished the opening lap in seventh place, before latching onto the group made up of Iannone, Viñales, Rossi and Marquez. Dovizioso then had to slow his pace due to a lack of feeling with the front of his bike, and he was passed by Pol Espargarò, finishing the race in seventh place just a fraction behind the Spanish rider. The final championship standings see Dovizioso in fifth place with 171 points and Iannone ninth with 112 points. 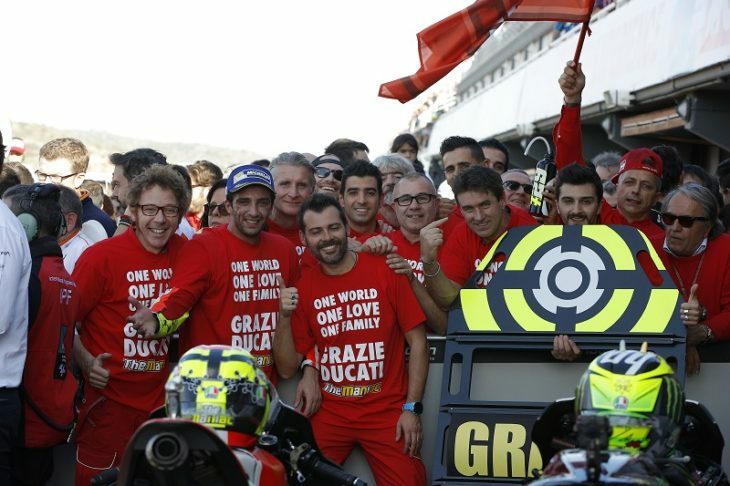 Ducati and the Ducati Team finished third overall both in the Constructors’ and Teams’ classifications.